Rigid Industrie' SAE Compliant Lights allow Rigid Industries LED Lights to be used on-the-road. Rigid created the perfect output spread and height achieved by the new patented Clarilux optic system. The color temperature of the LEDs is a perfect range of pure daylight to penetrate the night as your eyes read the road. The Rigid SAE Compliant lights project long range high intensity light while drawing very little power. 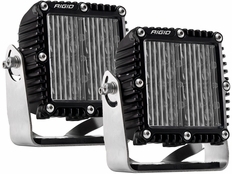 The low profile design, advanced engineered heat sink, cast aluminum durability and the highest quality of strength of a polycarbonate lens is the ultimate solution for your street-legal needs in North America. Your Rigid Fog Light Kit will include everything you need to get up and running: 2 Rigid Industries DOT/SAE Q Series Lights, Mounting Brackets, a wiring harness and switch, and installation instructions.